The 50th Anniversary Edition, 2018 Outback, Forester, Crosstrek, Impreza, WRX and WRX STI, Legacy and BRZ are coming soon. You can see in the image above, revealed on Subaru’s 50th Anniversary pages, they are coming in a new special Heritage Blue color. Subaru of America (SOA) is launching the 50th anniversary editions to celebrate the Camden, NJ automaker’s 50th anniversary in the U.S. market. Subaru said the 50th anniversary limited edition models will feature the new, Heritage Blue color (not officially announced) and will also come with special badging. The commemorative "Subaru 50th Anniversary" badge with a silver ring, gold star and the Heritage Blue color will be placed on the front fender of each model, and they’ll also get special silver wheel finishes. Inside, each model will feature black leather upholstery, silver stitching, silver seat belts, and special embroidered logos. 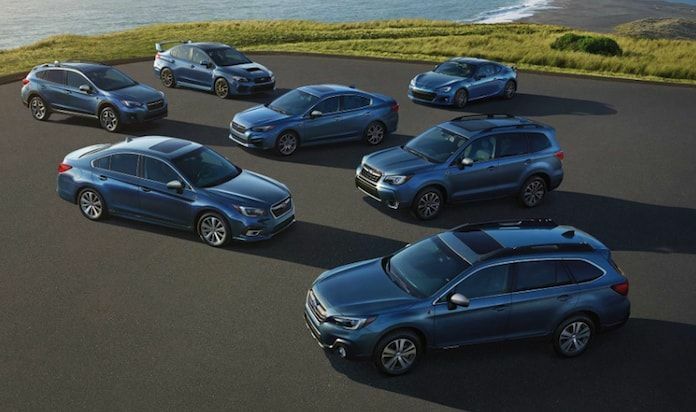 Limited numbers of each model are arriving now at U.S. Subaru dealers. Here’s a brief rundown of 50 years of Subaru in the U.S. market. 1967: Built under the Fuji name, the Rabbit S-1 scooter started production in June, 1946 even predating Vespa. 1968: Subaru introduces the 360 as an inexpensive yet distinctive economy car. It was “Cheap and Ugly”, powered by a two-stroke engine, the Subaru 360 claimed 66.3 mpg and sold for $1,297. It was $300 cheaper that the VW Beetle and was 1000 lbs. lighter. 1969-1970: Subaru introduces the FF1, the first front wheel drive car from Japan boasting a unique horizontally-opposed, water-cooled. 4-cylinder engine. The FF1 was marketed to rural America because its better handling FWD showed advantages on righter rural roads. The cat was available as a 4-door sedan, wagon, and a 2-door coupe with a 1088-cc engine. It sold for $1,699. 1973: The FF1 is replaced by the larger, more powerful Leone series, which is marketed as either a DL or GL model, regardless of body style to establish the Subaru name. 1975: Subaru launches the first 4WD wagon, the first four-wheel drive passenger car sold in the U.S. The car established the company as the leading 4WD niche marketer. 1977: Subaru introduced the BRAT (Bi-drive Recreational All-terrain Transportation), a small duel-range 4WD vehicle with two bucket seats fixed to the open bed back. Subaru targets the BRAT to the recreational market outside the northern states. The vehicle’s “fun and sun” concept also targeted younger consumers. 1980: A Subaru team appears for the first time in the World Rally Championship (WRC). 1984: Subaru unveils the 1985 XT Coupe, defining aerodynamic styling. Hi-lo dual range 4X4 is optional and for a short time a 6-cylinder engine is available. 1987: Subaru introduces the the U.S. to the Justy, the first modern mini-car from a Japanese importer and the only car in the U.S. sold with an Electric Continuously Variable Transmission (ECVT). The company also introduces full-time-4WD on GL and DL models. 1989: The Legacy is introduced, the first Subaru vehicle built in the U.S. and a clear move to position the automaker as more upscale. 1991: Subaru introduces its first performance luxury car, the 1992 Subaru SVX, selling for $24,445. The quirky SVX luxury sport coupe, 3.3-liter 6-cylinder, is available as a 1992 model. Discontinued in 1997, the SVX retains cult popularity even today. 1993: Subaru introduces the Impreza, available as an economy compact sedan and sport wagon. 1995: Subaru introduces the Outback, the world’s first sport utility wagon. 1998: Subaru introduces the Forester, a sport utility vehicle (SUV), smaller than the Outback but bigger than Impreza. 2000: Subaru unveils the ST-X concept car in January at the LA Auto Show. Reminiscent of the BRAT, this pickup featured an extendable 55-in bed and four full doors. Thew ST-X is built on the Legacy platform with a supercharged 230 horsepower boxer engine and a 5-speed manual gearbox. 2001: Subaru unveils the all-new Impreza WRX Sedan and Sport Wagon with a 2.0-liter turbocharged boxer engine at the North American International Auto Show. The model started the performance car craze in the U.S.
2002: Subaru introduces the all-new Baja crossover vehicle at the North American International Auto Show. 2005: The B9 Tribeca, is the first seven-passenger vehicle from Subaru. It was introduced at the North American International Auto Show in Detroit. Tribeca was discontinued in 2014. 2009: The Subaru Forester wins Motor Trend’s “SUV of the Year” award. 2010: The Subaru Outback wins Motor Trend’s “SUV of the Year” award. 2012: Subaru introduces the all-new 2013 XV Crosstrek at the New York International Auto Show. 2012: Subaru unveils the 2013 BRZ sport coupe, the first rear-wheel-drive Subaru in decades. 2017: Subaru unveils the 2019 Ascent at the LA Auto Show, an all-new 3-Row family SUV. It's making its way around U.S. car shows in 2018 and will make its dealer launch this summer. I have got 14 SVX cars brain fade was to blame, but a very underestimated car.